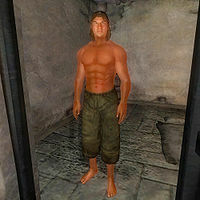 Jorundr is a Nord thief from Bruma, who has recently been arrested for armed robbery, and is now reluctantly staying in Castle Bruma's Dungeon. He may tell you the story behind it during Two Sides of the Coin, which differs from the story you hear from his girlfriend, Arnora Auria. As a prisoner, he will only wear sack cloth pants and carry a bread loaf. He won't be very talkative before you heard Arnora's story during the related quest: "Go away." If the quest hasn't been finished, he will just stand in front of the cell door all day long. After having finished the quest, he will be moved to another cell at the opposite side of the room, after which he will have a more lively, nonetheless boring, schedule: He wakes up at 7am after which he will have a 2 hour breakfast. After that he will just wander his cell until he goes to bed at 12am. The people of Bruma may be talking about what happened to Jorundr: "You hear about Jorundr? He was caught stealing gold, and now he's in jail! I bet Arnora's beside herself with grief." or "Poor Arnora. Seems her boyfriend, Jorundr, has stolen some gold from her and left her penniless. Now he's in jail, and she's destitute." When you ask about this, they will give details: "Arnora and Jorundr were once a happy couple, but that's over now. I hear that he took all of their money and stashed it after he committed a robbery. He was going to skip town on Arnora, but got arrested before making good on his escape. Now she has no money left at all. Poor thing. ", which will start Two Sides of the Coin. When you visit him after Arnora has revealed more details about the whole ordeal, he will be slightly more talkative: "I don't know who you are, nor do I care. All I know is that I want you to leave." When you ask him about the stolen gold, he won't tell you anything: "I'm not talking to you about anything. You're an outsider. I bet you're trying to trick me into telling something and the guards put you up to it. That fetcher of a guard Tyrellius is always trying to be sneaky. Well, you can forget it. Tell him it isn't going to work." When you get yourself thrown in prison, you will end up in his cell. At this point Tyrellius will walk up to him and unsuccessfully try to make Jorundr talk. Jorundr will trust you at this point: "By the way the guards tossed you in here, I can see you're no friend of theirs." Before he'll tell you about the gold, however, he'll want you to do him a favor: "I suppose I can trust you. In fact, maybe you can help me with a bit of a problem, and make some money for yourself in the process. I'm in here for the long haul. They got me for murder, even though I didn't do it, and once the Count makes a ruling, there's no way it's changing. I owe all of this to that heartless treacherous witch, Arnora." When you ask him what Arnora did, he will explain: "You want to know what happened? I'll tell you. I was betrayed. Stabbed in the back. I'm in here, and Arnora's out there living in my house. We were doing petty crimes all over Cyrodiil. Small scores; 10 gold here, 25 there. Nothing big enough to have them investigate you. Then along comes Arnora with a "plan" to waylay a tax shipment headed for the Imperial City. We're talking serious gold, complete with armed escorts. I told her she was crazy, but she insisted. Women have a way of getting men to do what they want. So we did it. We ambushed the shipment. In the process, Arnora killed a guard. I told her to be careful, and just knock them out but she didn't listen. We then buried the gold in the woods. Then she disappears to get "supplies." Suddenly the campsite gets raided by the Bruma City Guard. There's no way they could have found us. There's no doubt she tipped 'em off. But I was one step ahead. I had moved the loot while she was away. Hahaha. My final revenge. Or was it?" When you ask him what he's getting at, he will ask you to kill Arnora: "I'll tell you. I want Arnora dead. That's right, I said dead. She took my life away, now I want hers taken as well. You do this for me, and you get the gold. All of it. All I need as proof is that damn amulet she always wears. Show that to me and the money's yours." If Arnora somehow got killed before you get thrown in jail, he will greet you like this: "We have nothing to discuss." When you ask him about the gold and tell him Arnora's dead, he will still not tell you where the gold is: "So, she's dead, eh? Hahaha. Finally! Finally someone has wiped that stupid smug grin off her face. Good, good. I suppose you expect some sort of a reward? I don't think so. I have some gold tucked away, but we never struck a bargain. If I were you, after you're released, I'd get out of Bruma fast before the guards catch on that they let a murderer free." When you've killed Arnora, and return with the amulet she was wearing, he will tell you it's not the right amulet: "Haha! She fooled you but good. This isn't her real amulet, but a clever fake. The true amulet has a red stone. Clever girl, I taught her everything I knew. Too bad she's turned that knowledge against me. Come back when you have the real thing." When you show him the true amulet instead, he will be overjoyed: "So, she's dead eh? Hahaha. Finally! Finally someone has wiped that stupid smug grin off her face. Good, good. Well, you did your part of the bargain, now I'll do mine. The gold is buried outside the walls of Bruma, near the North Gate. Goodbye, I don't expect to be seeing you anytime soon. If I were you, I'd get out of Bruma fast before the guards catch on that she's dead." When you have both amulets in your possession, he will remark: "Two amulets? One of them must be a fake. Clever girl, taught her everything I know. Good thing you saw through her ruse. So, she's dead eh? [...] catch on that she's dead." When you ask him about the gold again, he will remark: "I've told you the location of the gold. You did your part, so have at it. As far as the amulets are concerned... keep 'em. They won't do me any good in here." After that, he won't enter conversation again: "Sorry, I'm too busy counting the number of rat droppings in my cell." Should you have agreed not to kill Arnora, and after having killed Tyrellius, Jorundr will greet you as his usual self: "I'm not interested in speaking with you!" After the quest, telling him how you found the gold, he will say: "So, you both tricked me, and now you're here to mock me. Fine, fine. I hope you were happy working with that deceitful wench. I'm sure she tried to con you out of half the money. Can't say I'm sad to hear about Tyrellius either. Good work, good work." In either case, when the quest is finished, the people of Bruma may say: "Arnora was killed. Such a shame. I wonder if Jorundr had something to do with it? I wouldn't put it past him." Esta página foi modificada pela última vez à(s) 15h12min de 10 de julho de 2013.